The feature-length animé Paprika has been my favorite movie this year. (Easily surpassing Harry Potter and the Order of the Phoenix , fun as it was, as well as the films seen at Cinequest. Yes, I rarely go out for movies.) Directed by Satoshi Kon, who worked on Perfect Blue and Paranoia Agent , it contains his trademark of being a psychological thriller with beautifully mind-bending imagery. Not for the faint of heart (indeed, rated R in the US), but a movie to relish. The people: Dr. Atsuko Chiba is the cool-headed psychiatric scientist. Paprika is the “dream detective” and Dr. Chiba’s perky (yet effective) alter-ego. 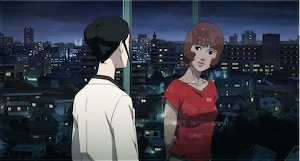 Police Detective Kogawa Toshimi is haunted by nightmares, and seeks psychotherapy from Paprika. Dr. Tokita Kosaku, enormous yet childlike, is the nerdy inventor-engineer of the DC-Mini, the device which allows a therapist to enter a patient’s dreams. What made them so enjoyable to watch was how they succeeded in not being (at least by convential American animation standards) as cold, as single-minded, as tough, or as naïvely clueless as you’d think. 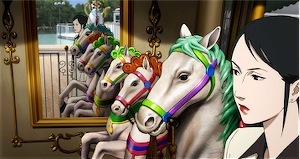 Dr. Chiba, merry-go-round horses, and eerie reflection in mirror. Image ©2006 Sony Pictures Entertainment. The story: One of the devices used for the dream therapy is stolen. By whom? Why? Dreams from different people intersect and baffle, outrageously and dangerously. Chiba, Paprika, Kosaku all race to retrieve it, at the same time trying to treat the Toshima’s disturbing anxieties, and trying to avoid death and further injury. Dr. Chiba reflecting on and reflected as Paprika. Image ©2006 Sony Pictures Entertainment. The techno-electronica soundtrack by Susumu Hirasawa is exquisite and deft. 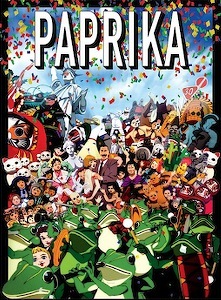 The music accompanies us through maniacal parades, confusing circuses, shape-changing chases (including great sequences where Paprika shifts between the Monkey King, Tinkerbell, the Sphinx and other memorable characters), and derelict amusement parks. Official US site, contains embedded Flash trailer. Apple trailer site, with links to various QuickTime trailers, including high-definition. This was written by sairuh. Posted on Tuesday, September 11, 2007, at 1:40 pm. Filed under Library. Tagged anime, movies, review. Bookmark the permalink. Follow comments here with the RSS feed. Post a comment or leave a trackback.